Today, I’m going to show you how to schedule a ten-page shoot if you’re looking to maximize your budget constraints. Shooting ten pages in a day is a worst-case scenario, but sometimes those worst-case scenarios can happen on your production. When they do, your shooting schedule needs to be very precise and prepared. What are the reasons for shooting a ten-page day? The most common reason I’ve come across for scheduling and shooting ten or more pages in a single day comes down to budget. It could be that your location or talent is only afforded for limited period of time, and you need to make the most of the day. It may be that production delays have pushed a bunch of pages into the end of your shooting schedule. Whatever the reason, there’s only one thing that can save you: an extremely detailed and thorough shooting schedule. StudioBinder's drag-n-drop shooting schedule builder. This principle goes farther than you might think. The time it takes your crew to walk from their parked car to the shooting location is not producing anything. When a PA (Production Assistant) needs to go to a trailer, fish out an actor, bring the actor across a parking lot to a waiting set isn’t producing anything. When your grip lugs a light stand from the grip truck to the set, that might seem like a productive use of time, but it’s not. If applied strictly, movement ≠ work, which means that this also represents an inefficiency that you need to address. 2. Enlist additional film crew to setup in advance. Let’s say you’re shooting in a location that’s only available (or affordable) for one day. Before your official shoot day begins, you might be able to hire a small crew to arrive earlier to load in equipment and possibly even set up the first shot in advance. 3. Save time by keeping everyone close to set. Make sure everything your production will need is set-up as close to set as possible. Restrooms, DIT, craft services and even where you’ll all break for lunch. 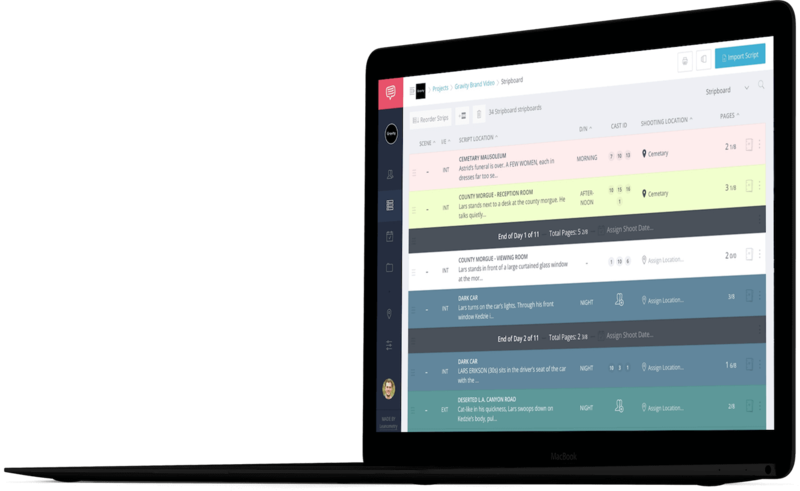 Let’s say you have 20 crew members and each of them grabs a snack from crafty, even shaving off 30-seconds from that walk will give you 20-minutes of productivity over the course of the day. 4. Add detailed shooting schedule notes. It’s important to develop a shooting schedule that reduces as much “movement” as possible between setups and scenes. Let’s say you’re shooting multiple rooms in a house. Plan the shoot so that each room you shoot is adjacent (or as close as possible) to the previous room you just shot in. This is where it’s useful to add banners to your stripboard to help the team stay focused on the day’s tight timetable. If you’re using scheduling software like StudioBinder or Movie Magic Scheduling, a banner is essentially a strip in your shooting schedule that conveys a note about the schedule. These banners can then be added as notes on your call sheet later on so your production can become aware of them. For example, instead of typing in a generic banner like “Company Move,” instead enter “Move from living room to kitchen. DIT, H/MU Stay. 10 minutes.” This conveys more useful data. A stripboard banner that conveys more useful details versus the typical "Company Move"
5. Move faster with a scaled down crew. The compartmentalization of on-set jobs is great when you need expertise, but it does slow down a production when you really need speed. 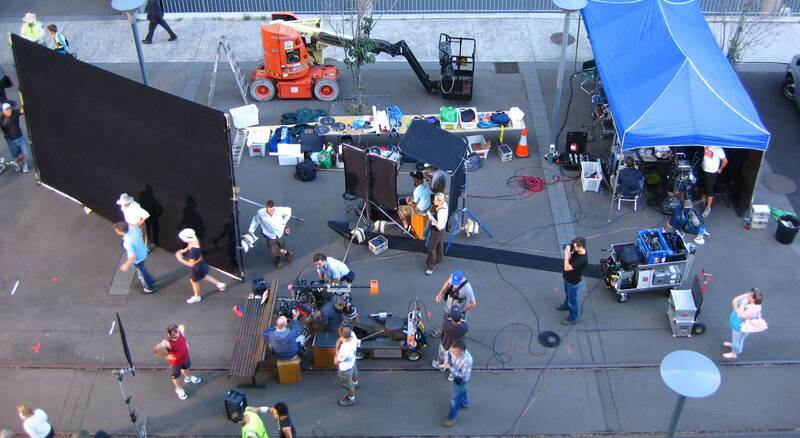 The fewer people you have on-set, the less time it will take the team to transition from one setup to the next. 6. Prep upcoming scenes to reduce downtime. 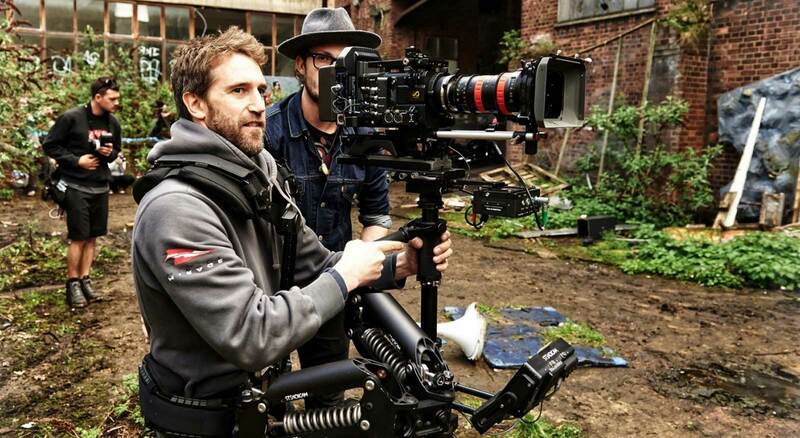 Alternatively, if you can afford it, and if the particulars of your shoot allow it, consider doubling your crew. When the “A team” is shooting one thing in one room, the “B team” sets up the next shot in the next room. In that way, production never has to stop for setup or strike between rooms. This only works if the creative and logistical prep is thorough. Otherwise, the oversize team makes production bulky and slow. 7. Shoot with multiple cameras at once. 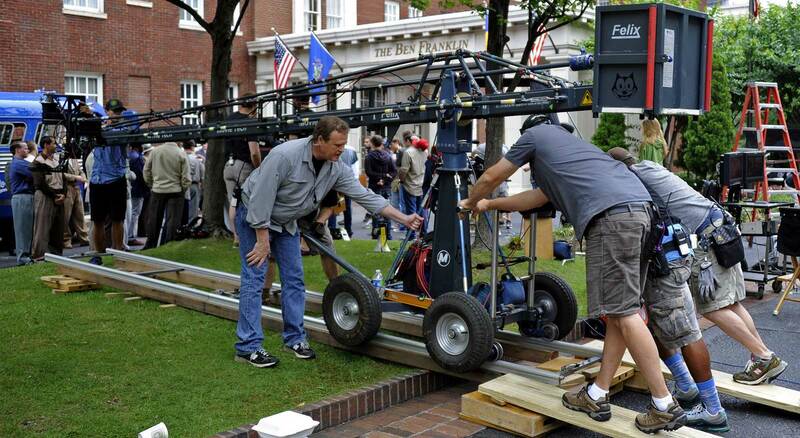 Multiple cameras or oversize formats are usually the go-to for creative efficiency on set. They both have creative and logistical drawbacks but can potentially save you a lot of time though. The eye lines in conversation scenes can get harder to manage. Lighting set-ups are more complicated because you have to light more of the scene. 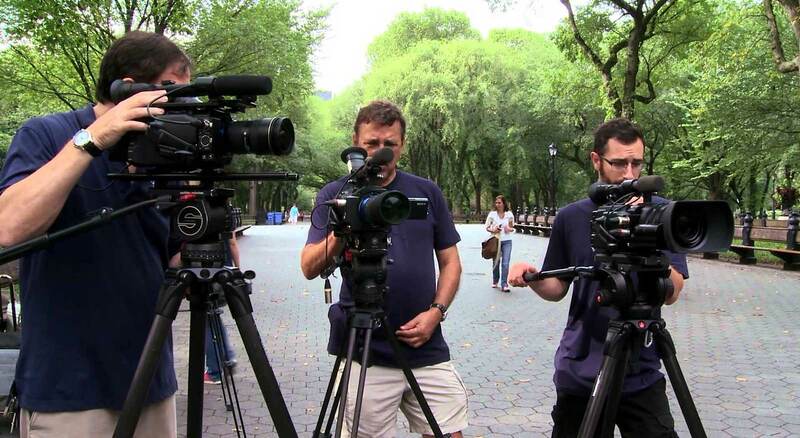 Your creative team needs to assess whether these drawbacks will counteract the efficiency of a multi-camera shoot. Shooting with oversize formats can be helpful to cut down on coverage-shooting time since it gives you more options in post. 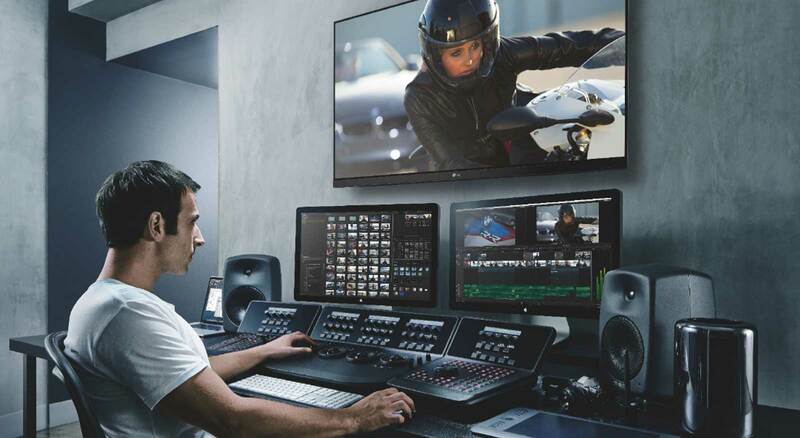 Let’s say your finished product is to be delivered 2k resolution. You can shoot medium-wides in 4k or 6k, and use the extra resolution to punch-in for your close-ups in post. That way, you can shoot wide and close simultaneously through the same lens. Creatively, this isn’t ideal since the lighting and framing for closeups might be slightly off. However, if the production aesthetic can tolerate it, this can save you a lot of time. It’s important to consider the cost of the extra resolution. Production and post will spend much more on data storage and management for all that extra footage. 9. Skip traditional coverage and shoot overlapping masters. Another efficient shooting option is to shoot overlapping moving masters rather than the more traditional three-point or five-point coverage. These are often fluid, moving shots that cover large chunks of a scene which are designed to intercut easily. If done right, the ‘overlapping moving masters’ technique gives you two angles for coverage that intercut easily and allow you to shoot through lots of dialogue very quickly. This is how I directed “Glimpse”, a contained thriller, with several 10-page days in the shooting schedule. They work best for long conversation scenes. Just light the room broadly, point the camera at one of your actors, and start the scene. As the actor moves, the camera follows. Interesting blocking can make this more dynamic. Shoot for as long as you can, ideally for a page or more. When the actor flubs a line or when the camera does something unpleasant, just cut the shot, go back a quarter page, and start again from there. Repeat this until you’ve shot through the entire scene. Make sure each ‘chunk’ of the scene is at least a half-page long. Then relight for the reverse angle, and do the same thing with the reverse shot. This technique gives you tremendous momentum with as minimal a loss of production quality as possible. Keep in mind that this is a stylistic choice so it needs to be carefully assessed whether this technique will match the rest of your film. 10. Schedule a production meeting with your crew. Once you’ve developed a strategy for getting through the day, it’s vital that everyone talk through it together. The director, AD, DP and department heads need to talk through the day. Discuss each setup, who’s doing what, how much time it needs to take, and where the potential trouble spots are. Take notes and present the timetable to the team after the meeting. This will be your ‘official’ shooting schedule. If it’s a few pages long, that’s fine. Everyone knows it thoroughly, and that’s what will make the difference on the day of the shoot. Remember that this meeting isn’t just about creating the final shooting schedule. By holding this meeting, you’re giving everyone a chance to learn about each other’s role for the day. When your team members know each other’s responsibilities, they’ll be able to help each other keep up with the demands of such a tight shooting schedule. Learn more about the pre-production planning process right here. We hope that you’ve found these tips useful to help you maximize your budget by shooting more pages in a day. As we mentioned, a lot of this goes back to how you structure your shooting schedule. You can also learn how to create a shooting schedule using a stripboard right here. If you’re looking to speed up your workflow, give StudioBinder a look too. 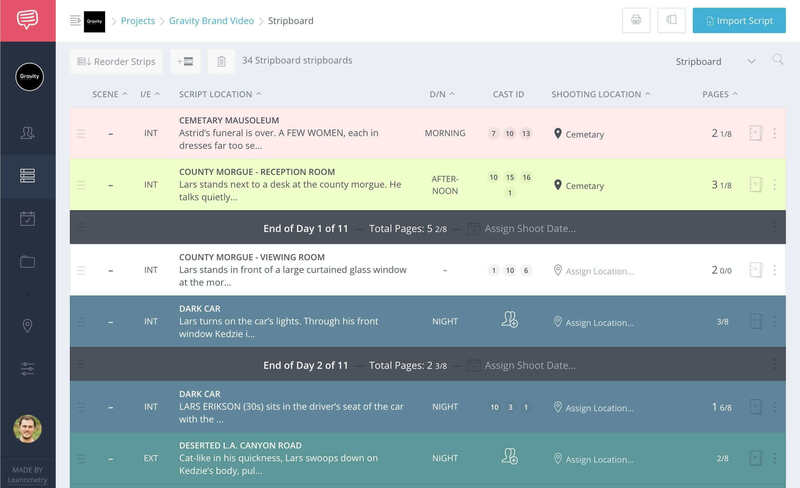 You can import a Final Draft script (.fdx) and create a robust shooting schedule in no time. StudioBinder is free to get started. Check it out here. Plan and create more effective shooting schedules.